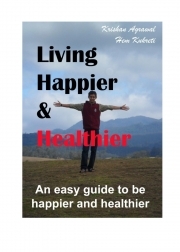 Description of "Living Happier and Healthier (eBook)"
All of us in whatever state of health and happiness are as of now, definitely wish to improve on both fronts i.e. health as well as happiness, but very few of us really intent to do so. Most of us live with a BIG MYTH that the condition of our life is determined by our upbringing and the circumstances we live in, but the fact is, though the upbringing and the circumstances do have a major impact on the condition of our lives, yet they do not determine it. The simple concept we have to follow is 6 and 8 formula; avoiding 6 things and practicing 8 things explained in the book. Reviews of "Living Happier and Healthier (eBook)"